Pain, inflammation, migraines, anxiety, insomnia, – these are all conditions that a CBD tincture can potentially help alleviate. Cannabidiol, commonly referred to as CBD, is an all-natural therapeutic compound that you have may have heard of by now. CBD is the most well-known cannabinoid besides its sister compound, THC. Unlike THC, CBD does not cause any psychoactive effects, and it’s specifically used for medicinal relief. If you want to learn more about what a CBD tincture is, how to use it and how it may benefit you, continue to read below. You can acquire the benefits of CBD from edibles, inhalables or topicals, but the purest form comes from a sublingual CBD tincture. Also known as CBD Oil, CBD tincture contains a concentrated cannabinoid liquid compound extracted from the Industrial Hemp plant. At Nature’s Script, we use the CO2 Extraction method to derive the CBD used in our tincture. The CO2 Extraction process is regarded as a superior, environmentally friendly method for obtaining a purely Cannabinol compound, free of any THC. How Do I Use a CBD Tincture? CBD tincture generally comes in a glass bottle with a built-in mL dropper. Tinctures are highly concentrated, and the dropper allows you to measure out your desired amount. Once you determine your correct dose, you can drop the oil underneath your tongue. 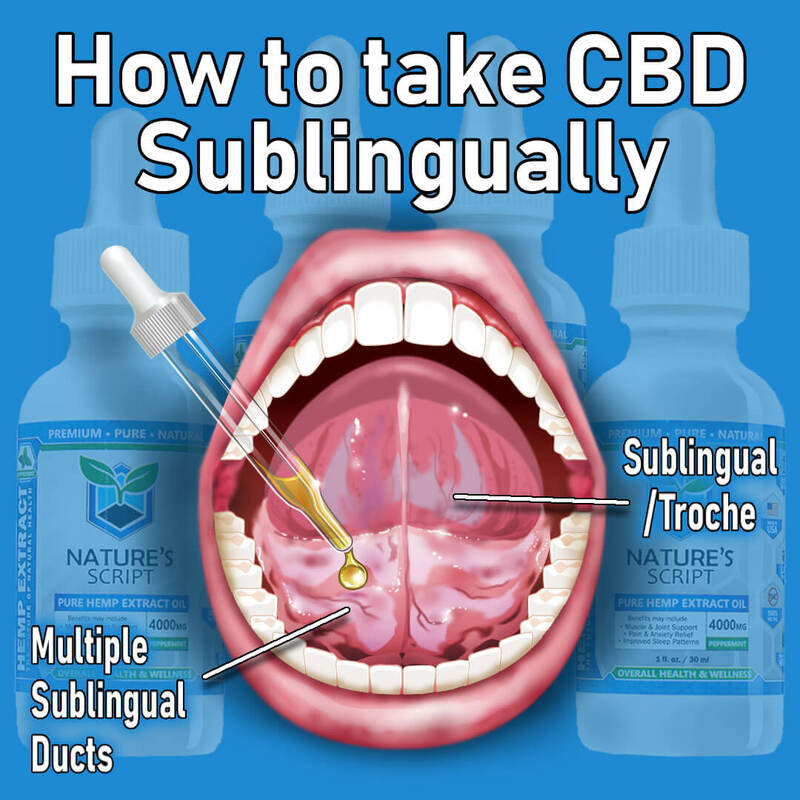 When you take CBD Oil sublingually, the mucous membranes under your tongue allow for quick absorption. After holding the oil under your tongue for about a minute, you can swallow what’s left. If you don’t want to take your CBD tincture sublingually, you can always apply it to your food or beverage of choice. Adding CBD to your meal or drink, however, will take your body longer to feel the effects. Taking a CBD tincture is the most preferred method for many people because the effects often appear within an hour of administration. If you are unfamiliar with CBD tincture effects, do not worry. You will not feel intoxicated or any sort of “high” upon using CBD. Instead, you may feel relaxed and a sense of overall calm. We recommend taking CBD at home for the first time because it may make you feel tired. CBD works with a collection of cannabinoid receptors in your body called the Endocannabinoid System (ECS). The ECS is located throughout your central and peripheral nervous system and maintains your mood, sleep cycle, pain and inflammation levels and more. Your ECS is the reason why you may experience relief from pain, stress, sleep deprivation, mental fog and more. Since everyone is different, you may not receive CBD’s effects as fast as others. It’s best to start with a small dose and increase your intake once you know how your body reacts to CBD. What are the Benefits of Using a CBD Tincture? If you want to learn more about CBD tincture and how it can help combat specific conditions, visit our CBD Oil benefits page. Here, you will find a more in-depth analysis of how CBD works with your Endocannabinoid System to help your anxiety, pain, sleep, skin, pets, and overall wellness.